Today is the Bead Soup Blog Party reveal!! Today is also the letter "L" for the Blogging from A-Z challenge. So for the letter L - I will say, L is for Lori - our delightful host of the Bead Soup Blog Party. Lori has been hosting this party for years, and it's been a wonderful success and so much fun for beaders around the world! There were so many participants for this year's Bead Soup Blog Party (BSBP), that Lori put us in groups and today willk be the second reveal date for all our partners. My partner was Kepi, of "A little of this, a little of that." I've actually known Kepi for a while now because we met through our blogs, so I was very excited to be her partner! She sent me a wonderful soup! I played with this soup like crazy. As you can see with the above photo I originally planned a peyote bail, however, when I proceeded to make a rope for it, I didn't like the direction I was going. I also made a peyote/herringbone teardrop, an embellished right-angle weave rope, a few purple discs and so on ..... but none of it was working for me! Finally I told myself to KISS....."keep it simple, stupid"! So I did. I just did a simple seed bead bail, with some black silk cord. The clasp Kepi included was so darling. Then onto the rest of the soup. I absolutely adored the turquoise-ish ceramic beads that Kepi included in my soup and just loved the brown tones in each bead. Finally - those adorable polymer flowers! I just loved their blue hue, with gold and green swirls. I made a peyote strap and embellished with the polymer flowers. Many thanks to Kepi for the delightful soup! And many thanks to Lori for hosting this fun event! 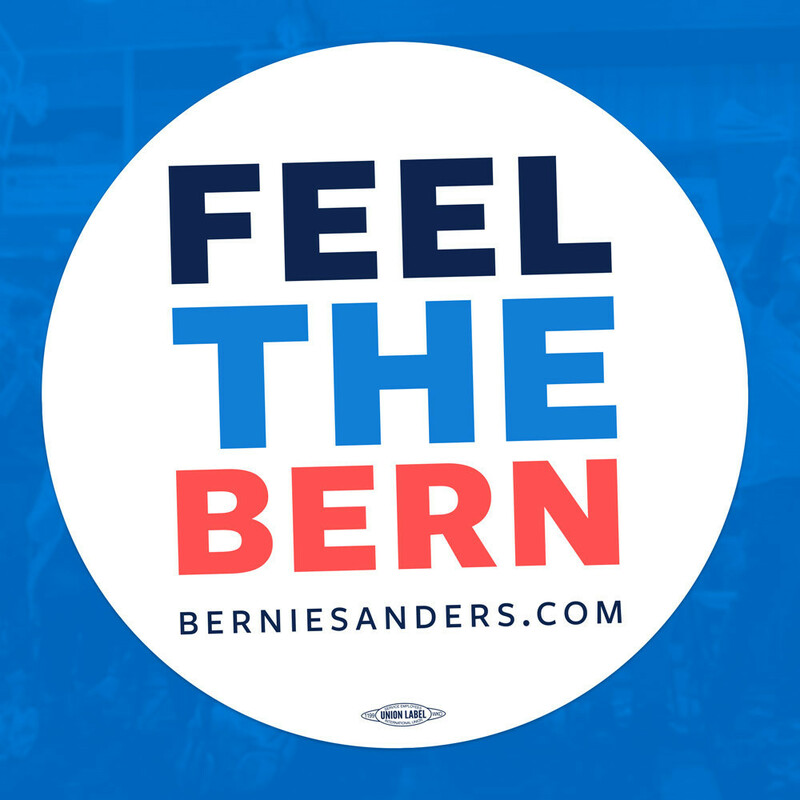 PLEASE check out all the other participants!! Great soup, absolutely love the floral bracelet!! Love the bracelet and the brown and blue necklace. Great Job! Love the browns and turquoise together and that cute flower bracelet! Excelent use of your soup! Gorgeous pieces! My favourite is the first necklace with striking pieces and simple design to showcase them. Such a adorable focal bead in your first necklace! 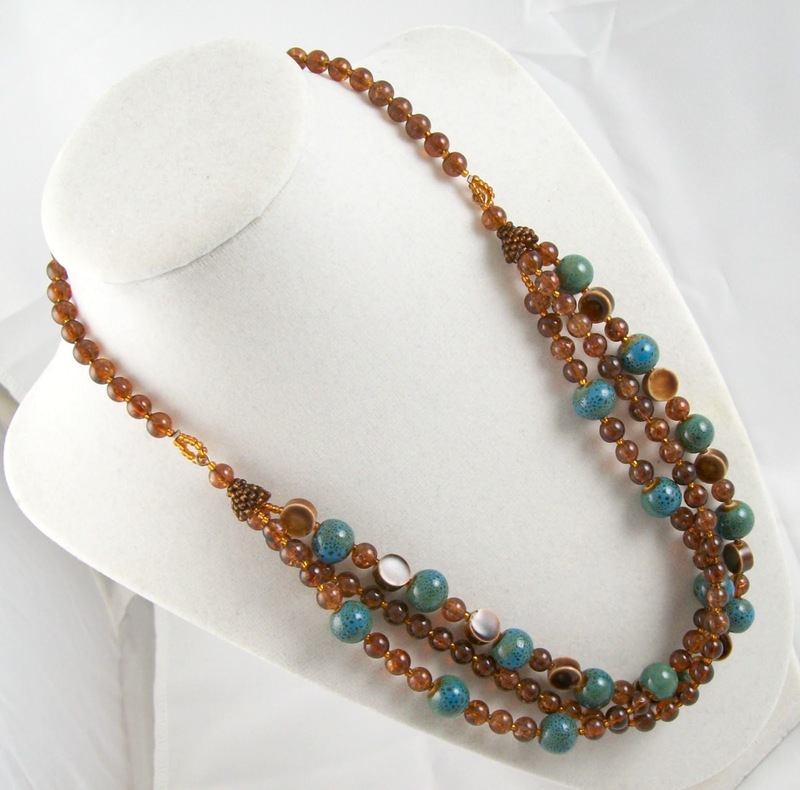 I like your designs, the brown / turquoise collier is very elegant. Surely something I would wer very often! Great jewelry! I’m in the third reveal. Can’t wait. I love what you did with your bead soup. All of them are fantastic! Awesome pieces - Love the "KISS" necklace :) It turned out awesome. The second necklace is too die for - love that color combination and I love the multiple strands! 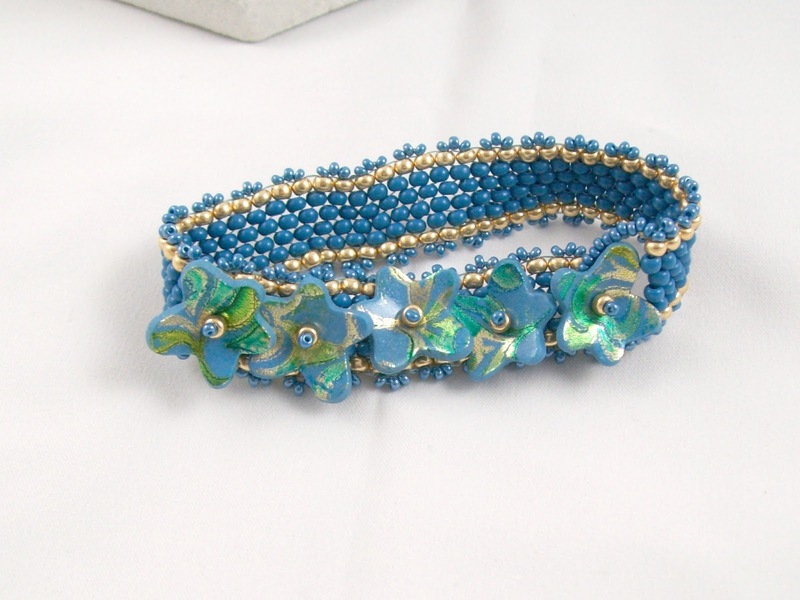 Love what you created for the bracelet - love those blues and I love how the flowers were used! Fantastic job! Your keeping it simple... is amazing! That focal needed to be diva on simple black cord with one accent shade. The brown with the turquoise is beautiful. Beautiful work!! Love what you did with your soup! You really did a beautiful job with your soup. I love the KISS necklace, the focal stands out spectacularly. The turquoise and brown necklace is absolutely stunning, I love the color combination and I love the multi strands, just beautiful. The bracelet is so cute, you did a fantastic job show casings those little flowers. Beautiful work. I was proud to be your partner. That's become a lovely statement piece for a nice event and your multi-strand necklace is nice for work.I love the beaded endcaps! Does the bracelet stretch or did I miss the clasp? Beautiful pieces! I especially love that multi-strand necklace. I just drooled all over that second necklace. Sorry about that. LOVE. Everything's beautiful, but bronze and turquoise together are just awesome! Beautiful bead soup! I love how you used the focal and the seed beads in your KISS necklace. 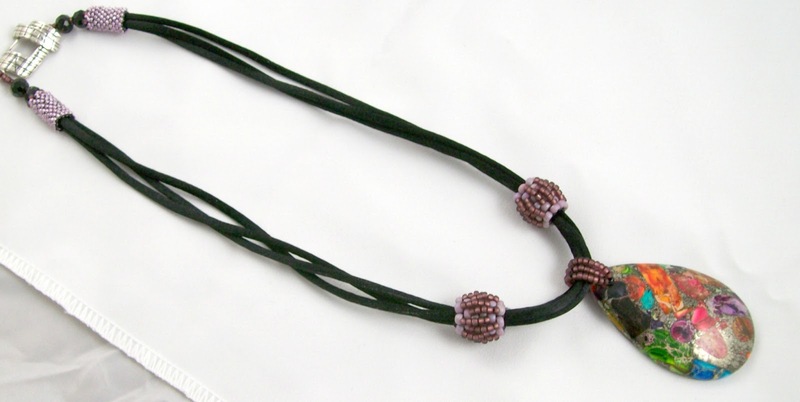 The second necklace with the multi strand design is gorgeous - love that you used some seed beads in it too! The bracelet is stunning! Love those polymer clay flowers! Everything is beautiful but I especially like the triple strand necklace! tri-strande necklace is the best! congrats! Sometimes less is definitely more! That KISS necklace is a stunner, what is the focal made of? Lovely work ! KISS is a process I still need to learn. :P I love that bright, rainbowy focal ! Awesome pieces! The bracelet is my favorite. Nice! Multi strand is beautiful!!! Love your first necklace and the stringing combination of the second necklace is beautiful. I love those beaded beads you did on the first necklace. Please, please, please tell me how you made them. I'm just attempting to learn to make beaded beads and I love those. Please......(picture me begging). How beautiful! You did such a creative job - I think you were right with the KISS principle. It worked! A beautiful variety of jewelry! I love the peyote with the flowers! Hi Amy, I am in love with the bracelet. It has a beach feel to it, even with the flowers and its awesome. Oh Amy, I'm having the same issue with my focal, but I hope I've found a good solution. I like your first necklace, keeping it simple gives the beautiful focal its place! hey how neat you used one of the flowers as the clasp in the bracelet. I just love all of your pieces. Great job. Great pieces and that brown necklace is a real stunner! Hi! Another third revealer leaving a comment here! The first focal was so vibrant keeping it simple really worked. It's stunning. Love what you did with the turquoise beads but then browns are my color of choice. 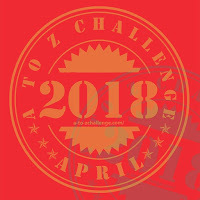 Great going with the A-Z challenge also. How gorgeous! Love the soup you got and what you did with it. The blue and the copper tones are awesome together. Well done! WOW!!!!! Beautiful and I am loving that pendant. It's gorgeous! Is it enameled metal or clay? All your work is beautiful, especially love your "Kiss" piece! Very pretty designs!! Nice job! Lovely things you have made I especially like the bracelet with the poly,er flowers its so pretty! Everything is beautiful but I really love the bracelet with the little flowers, SO pretty!! Gorgeous! I love your first necklace.....elegant and classic.The colour combination of blue and brown is one of my faves as you'll see next week in the 3rd reveal! Wow, amazing what you do with the little beads! I am in awe! The necklace with the focal is beautiful! Great job! I think you did an amazing job! Your creations are beautiful! Beautiful designs, I love all of them. Fantastic creations. I am from the first reveal. My favorite piece is the bracelet with the polymer flowers. All three designs are beautiful but I'm in love with the three-strand necklace - it's absolutely gorgeous. Great work. Really beautiful pieces! The brown and blue necklace is my favorite and the polymer flower bracelet is cute! All of your pieces are beautiful, but I am totally blown away with the brown necklace with the blue ceramic beads just stunning. Amy, those are beautiful. I love the triple strand necklace. It is so lush. The bracelet is amazing. I love the flowers and the colors. Debbie is a great partner. We were partners for BSBP6. You did fantastically with that focal. I was really curious how it would end up. I especially like the brown & teal necklace. It's just so rich and warm. Can't forget about that darling bracelet though. SO cute. Well done all around Amy. Very cute beaded bracelet. I love the flowers on the front. I love what you did! Everything is just so lovely. :) My favorite, though, is the bracelet. ;) Love those little flowers, too! Love the peyote strap bracelet - great colors! Oh Amy! I love that first piece, and I totally know what you mean about trying so hard to get a concept to work. I have several pieces on my desk that were, "Oh, this will work...not". Love that simple look, and you still got some seedies in there. I don't usually gravitate to strung pieces, but that second necklace really works for me! And you know I have to ask, did you make a clasp for the bracelet, or does it just slip on? Great job girl! I like all the pieces. They are so different from each other and are so creative. I'm so glad I found you through the blog hop. Amazing work you make!! I love what you did with the soup. All so different and ALL so beautiful!! Love them all but think the blue flower bracelet is my favorite--loving that Springtime look!! 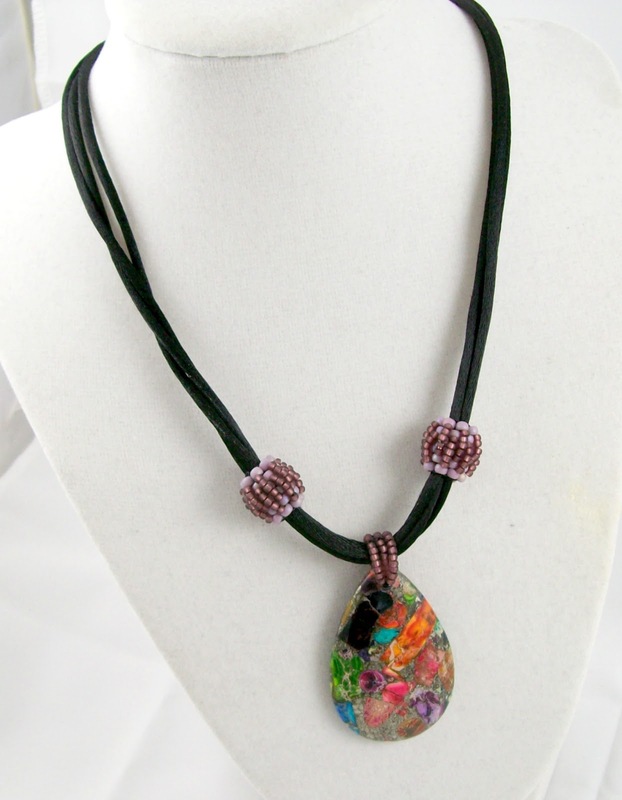 You did a great job of mixing color for a dramatic affect on the necklace very nice. Cute bracelet. Love the bracelet and the blue and brown autumn toned necklace. Great work! So cute! I particularly like the multi-strand necklace, and the way you integrated the clasp of the bracelet into the strip of flowers is great. I really had to look for it! Those are all great - beautiful work! Beautiful designs! I love the way you incorporated your amazing beadwork into each piece. So smart to KISS that pendant! Love the three strand, especially your beaded cap connecting the strands. And the bracelet is darling! Great job using your soup. Your designs are creative. You created some really nice pieces. I like the wide variety in the items you made. It shows your diversity! Absolutely love that second necklace. That color combo has to be one of my favorites. WHAT a cool focal and clasp! You did a lovely job, and I didn't know you already knew Kepi! Thanks so much for participating, and many apologies for my being late.